The Data Lanterns are a network of sculptural civic totems that reveal and illuminate layers of urban data. The Data Lanterns are a network of sculptural civic totems that reveal and illuminate layers of urban data. They create poetry out of infrastructure and celebrate the ebb and flow of the city with animated beacons of flowing light. The vertical lanterns are connected to data from neighboring transportation systems and inform pedestrians about the arrival and departure of trains, buses and ferries. The lanterns are physically attached to existing vertical light posts and signaling poles. They transform these utilitarian columns into data-informed light beacons that animate the streetscape both day and night. The project was instigated by the Market Street Prototyping Festival. 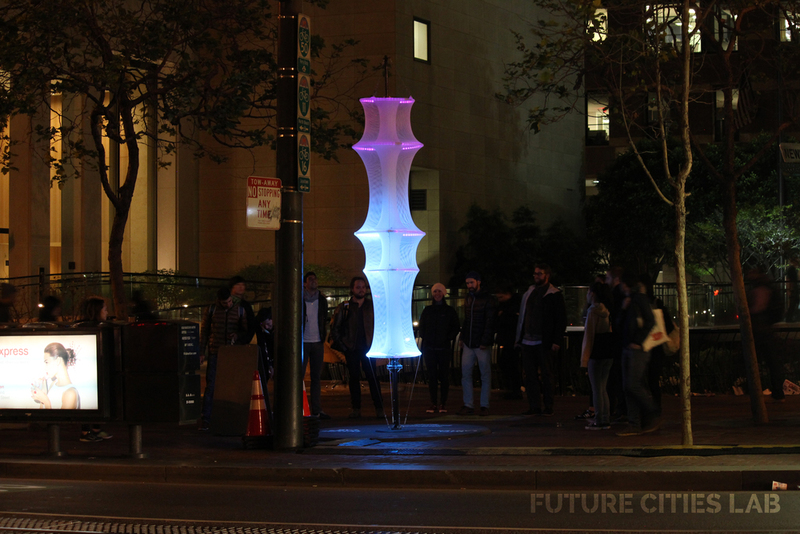 A prototype of one Data Lantern will be on display on the sidewalk in front of 575 Market Street from 8am Thursday, April 9 through Sunday, April 12, 2015.